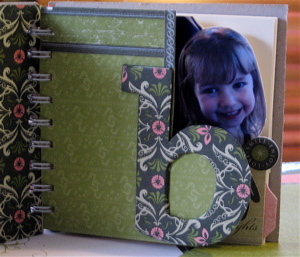 Make Creative Journals For Many Occasions Using Simply Scrappin' Kits And Stampin' Up! Stamp Sets. I have always wanted to make beautiful Journals, but found the concept of doing all the art work from scratch, a little bit daunting. 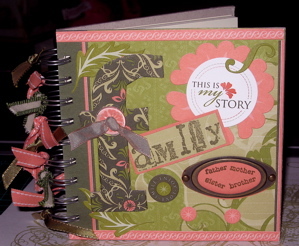 However the beautiful Simply Scrappin' Kits available in the Stampin' Up! 2008 -2009 Idea Book and Catalogue, inspired me to do a journal making class with 2 of my downline and my sister. It was such a wonderful day - inspiration came quickly for some of us, others took a little longer, but the spirit of sharing ideas and inspiring each other generated so much creativity, we hardly had time to stop for lunch!. I introduced some of the page altering concepts we were shown at Convention by Carrie Cudney, and the ideas just took off. All images © Stampin' Up!. Artwork by Ann Craig. I split this page in half, giving me a number of interesting combinations over about 3 pages. I used some of the stick ons from the Simply Scrappin Kit, but also stamped some flowers from the Brocade Basics stamp set, and cut them out leaving a white border. 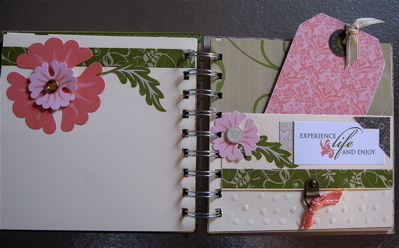 I used Groovy Guava ink and repeatedly stamped the half flower image without re-inking. I was thrilled to find this gave me perfect colour matches with the kit colours. My sister Linda is always inspired by her little granddaughter, so of course she was to be the subject of her journal. Sue chose "family" as her theme, Kari chose "Nanna," and I decided to make a journal about mum's 80th birthday. We used the Secret Garden Simply Scrappin Kit. It can be found on page 139 of the IB&C. Brocade Basics and Baroque Motifs Stamp Sets co-ordinate beautifully with this kit, and the new In Colour Inks Groovy Guava and River Rock blend in beautifully. Here Lin has used an On Board "b" to define the shape of a couple of pages prior to the photo page. She then added all sorts of embellishments on these altered pages to create an interesting journey through the pages. You can see how beautifully the papers from the Secret Garden Kit co-ordinate with each other, and how the detail strips make wonderful highlights. There is no need to always make Journals that take hours, and using the Simply Scrappin' Kits certainly speeds things up. I love the way the images are printed on card stock so you get equivalent thicknesses to stamping and cutting out images. This makes mixing and matching so easy. On her cover, Sue experimented with different thicknesses and textures. She covered the On Board letter "f" with paper from the Secret Garden Kit, attached a button at a focal point and detailed it with some chocolate taffeta ribbon. Some Hodgepodge, stamping, cut out swirls and stickers from the SS Kit complete the art work. Finally ribbons from the "Theatre" Ribbon Originals and Double Stitched "In Colour" range were tied on the binding. If you love this cover and want to order some of the items, browse the catalogue to find items used in these Journals. You will find the stamp sets on page 98 and 101 and the ribbons on pages 146 and 147. To get the On Board letters you will need to look at page 140 - On Board Simon Lower. form to contact me and I will advise when the next workshop days are scheduled, and order the products you will need. Here is a peek at just a couple more pages, I hope you are inspired! I am planning on adding photos from our celebration and leaving just a few areas for the new owner to make her personal notes about the occasion. To see more of my website, click here and navigate around to see what I have been doing. 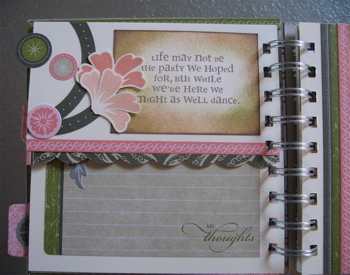 See more journal pages here. 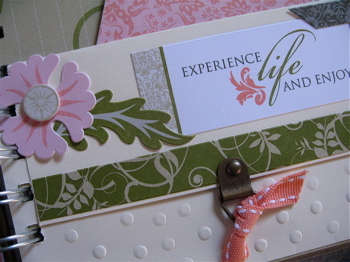 For more free ideas about scrapbooking, layouts and scrapbooking tools visit TheArtfulCrafter.com.